Dawn McMillian (center) and Curtis Williams (right), wellness specialists in the Faculty Staff Assistance Program, coordinated the Move More Challenge. Danielle Burt (left), a student in Rollins School of Public Health, worked with the program as an intern at FSAP. 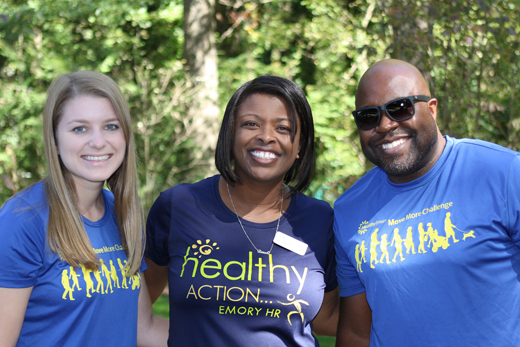 Over the past eight weeks, more than 6,000 employees from Emory University and Emory Healthcare walked more than one million miles in the Move More Challenge. The program, which began Sept. 21 and concluded Nov. 15, encouraged faculty and staff to add more physical activity to their daily routines. Challenge participants used a Fitbit device to track their activity, set goals and compete with their friends and co-workers. Collectively, participants averaged 9,116 daily steps. Individual challenge participants who met certain thresholds were also entered into a drawing to receive prizes at the end of weeks four and eight. Week eight winners were recently announced. "The real winners of this challenge are those employees who committed to moving more and truly felt the benefits of a healthier lifestyle," says Michael Staufacker, director, health management. "We have heard from many employees and Emory leaders who are excited about the positive changes that have resulted from the challenge." Kore Breault, senior associate director of development at DAR and one of Emory's 55 wellness champions, says one fun thing about the challenge has been watching colleagues get excited about walking. "Often people will stop me in the hall to report on their progress and share their excitement over how many steps they are achieving," Breault says. "I believe this challenge is making a difference and that more people are taking the stairs instead of the elevator or walking down the hall instead of sending an email or making a phone call." Sandy Gruszka, care manager at Emory Saint Joseph Hospital, adds that the benefits of the challenge will continue even though the official competition has concluded. "Since joining the Move More Challenge, not only have I been motivated to walk 10,000 steps a day, but so have my co-worker," Gruszka says. "And we continue to challenge each other to see who can have the most steps for the week!" All challenge participants will receive a survey to provide their feedback. The survey data will help inform plans for developing future challenges and programs, explains Staufacker. "We would love to have all Emory leaders continue to support their employees to move more every day in the coming months," he says. "The challenge may be over, but our hope is that faculty and staff will keep the momentum going. Use your Fitbit, stay active and enjoy the benefits that more daily physical activity brings."